Both prizes recognize Zeta Espacial´s efforts to extend its market beyond geographical borders and for its commitment with quality. Zeta Espacial S.A. has been awarded the “Superior Taste Award” 2014 Award, given by the iTQi, for its more international product, the Pop Rocks® popping candy, in the Sweets and Candies category. The iTQi (International Institute of Flavour and Quality) is the European organization dedicated to taste and promote superior food products and beverages. Every year prestigious experts evaluate the qualities of hundreds of products. Only the ones that reach the high expectations of the jury in terms of taste quality are recognized with this prestigious international Award. On June 4th, Zeta Espacial will also receive the major “PYME Award”, within the Internationalization Category, awarded by the Spanish EXPANSION business newspaper and the IFEMA organization, recognizing the efforts made by the company during the last 35 years to expand its activity beyond geographical borders. The PYME Awards recognize the task of Spanish SME’s, which represent 90% of private employment in Spain, honoring their initiatives and excellence in different strategic areas of their business. Also in 2014 Peta Zetas® was awarded the “Flavour of the Year 2014” Award in the Food Service Category, received only by those products that stand out for their quality and flavour in the world of hotel industry, restaurants and artisan experts. These awards confirm a strong trend: the use of Peta Zetas® and Pop Rocks® as an ingredient in a large number of applications, from the most innovative gastronomy creations to leading products of Top 500 Food Companies worldwide. Peta Zetas® and Pop Rocks® have come to be a unique and innovative ingredient in products such as ice-creams, chocolates, yogurts, desserts, cookies or cereals among many others, offering a surprising and multi-sensorial effect in applications in other food products. Zeta Espacial´s R&D Department has extensive experience and know-how to guarantee that the application of our popping candy in all these products will be a complete success. Since 1979 Zeta Espacial is aiming for expansion with a growth strategy based internationalization, quality and innovation. In 2002 the company consolidated its internationalization strategy with the creation of two subsidiaries in Mexico and the United States. 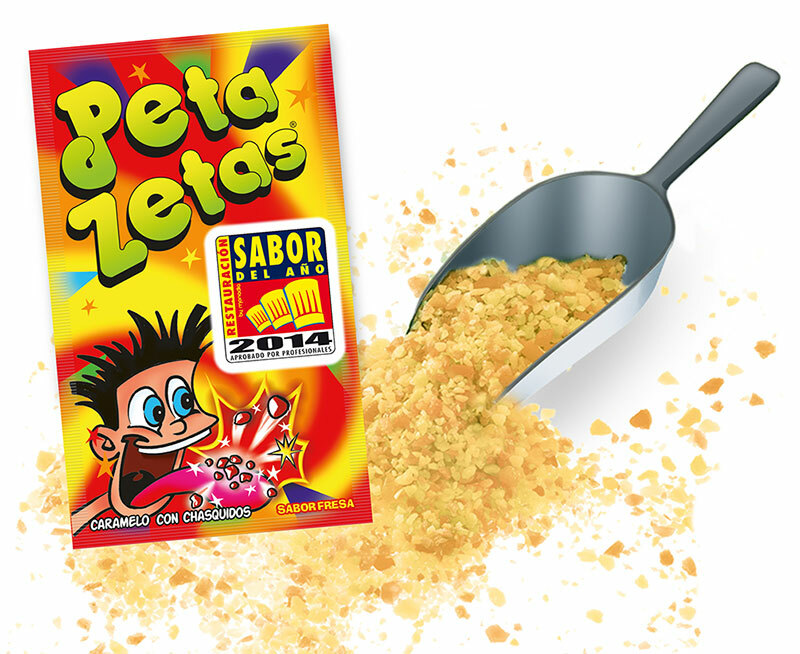 Nowadays Peta Zetas® and Pop Rocks® are sold in 60 countries worldwide, under various brands and presentations.